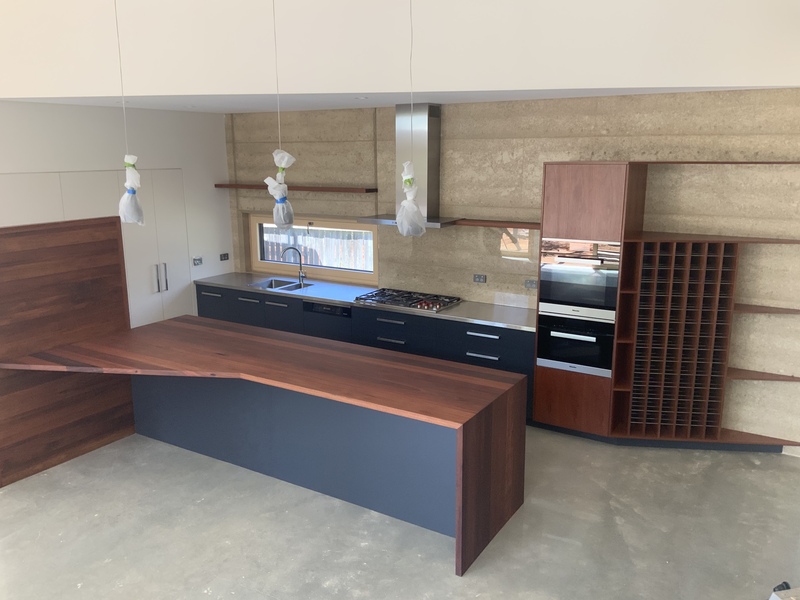 We combine quality joinery, clever storage solutions and expert design to create the ultimate culinary workspace for your home. Do you already have your design ready to go? E-mail your plan through or give us a call so we can arrange a quote! Are you dreaming of a shiny new kitchen? So you have perused the internet painstakingly for months saving, pinning and drooling over countless images of your dream kitchens. Finally deciding to go ahead with installing a new kitchen in your home is very exciting! But before you head out and buy new cutlery, toasters and matching dinnerware sets, there are some important things to consider in your design process to ensure you end up with exactly what you want and need. Are you a keen cook? Is your kitchen a central part of the home? Do you have lots of gadgets and small appliances? How much bench space do you need? What is a safe comfortable height for your family to access the microwave? What sort of sink (double/single) is practical for your needs? What large appliances (multiple ovens, dishwasher) do you need to allow space for? Will there be a separate walk in pantry area or will food be stored in the main kitchen? Do you want to include a seating area such as an island bench? Do you want to include a dedicated utilities drawer / cupboard to act as a charging spot for phones/laptops etc? The kitchen area tends to be the hub of the home and as such it has to be a practical space. When designing, we need to think carefully about who will be using which parts of the kitchen every day. Are there children in the home? Kids can be pretty rough on kitchens, drawer handles are never supposed to be used as stair cases and bench tops are certainly not walkways, but despite best efforts at the end of the day many parents are left not so much wondering how the dried weetbix has glued itself to the top cupboards but what on earth they are going to get it off again without potentially damaging their cupboards surface. Luckily there are lots of innovative yet simple solutions available to keep your kitchen safe from sticky little fingers. From soft close hinges for doors and drawers to fingerprint resistant easy clean surfaces, you can still achieve your dream look in a way that is practical and safe for your family. What sort of cupboard and bench surfaces will suit your family & lifestyle? Marble benches, for example look exquisite. They are a frequently seen on magazine covers and on popular design websites, but they are a porous surface and as such not necessarily practical, particularly if you like a nice relaxing glass of red wine in the evenings, then you might find yourself with unfortunate red rings permanently embedded in your beautiful new bench top. But even if marble isn’t the practical option for you, it doesn’t mean you have to give up on your dream look, instead of the real thing, you could opt for a marble-look laminated surface or created stone which still give an elegant finish but are less prone to staining and tend to be more budget friendly. Composite stone and granite offer a beautiful and very durable surface available in a wide range of colour and style choices to suit any kitchen. Laminate is the most affordable option and it is available in a massive selection of colours and patterns with texture options such as a more matt stipple effect through to high gloss. Stainless steel and timber are also popular choices, they may require a bit more upkeep than a stone or laminate surface but a lot of people find the aesthetic result is well worth the effort! Humans are by nature lazy, or as I prefer to call it ‘practical’. Can you reach the mugs the coffee and the kettle without having to walk all over the kitchen? Are your spices stored close to the stove top to avoid leaving the simmering stove unattended while looking for that elusive jar of Chinese 5 spice? Popularly known as the ‘kitchen triangle’ the art of minimising the distance between the Fridge, Stove and Sink has become a well known kitchen design rule, but there are lots of other things to consider too. Planning ‘what’ to put ‘where’ needs to be considered in the early stages of your kitchen design as there are some wonderfully innovative hardware products such as lazy susans and pull out pantries for awkward corners, pull out bins, slimline spice rack pullout cupboards that sit neatly next to your oven and so forth that will make your life much easier but aren’t nearly as easily installed 3 months down the track. Do you have any special needs that may require varying the height/width of benches or allowing additional space to gain safe access to cupboards and drawers? How can you maximize the space is available to you? There are lots of things to consider when designing your new kitchen but with the range of clever hardware designs on the market today you no longer need to be limited by smaller spaces or tricky hard to access corner cabinets.